There are three likely reasons you would do a workout entirely with machines. One is that you fear free weights. Another is that you’re in a hotel gym with machines as your only workout options, and the third is that you’re a little beat up and need to protect overworked joints or work around nagging injuries. 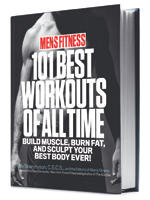 Whatever the case may be, machines are suitable muscle-building equipment, and you can train your whole body with them. This workout uses a classic bodybuilding approach: pyramid sets. You start with higher reps and increase the weight slightly each set while reducing reps to gradually warm up the muscles and joints and recruit more and more muscle fibers. No matter how hard you train or how heavy you go, you’re unlikely to get injured, because the machines are stabilizing the load for you. This isn’t always ideal, but it does allow you to push yourself and focus your mind solely on the muscles you want to work without worrying about a freak accident keeping you out of the gym for weeks. Perform the exercise pairs (marked “A” and “B”) as alternating sets. So you’ll do a set of A, rest, then a set of B, rest again, and continue for all the prescribed sets. The remaining exercises are done as conventional straight sets. Sets: 3 Reps: 12, 10, 8 Rest: 60 sec. Adjust the height of the seat so that the handles are in line with the middle of your chest. When you grasp the handles, your elbows should be bent nearly 90 degrees. Press the handles until your elbows are locked out. Keep tension on your muscles at the bottom of each rep. Using a chest-supported row machine, row the weight to your belly, squeezing your shoulder blades together at the top of the movement. Sets: 3 Reps: 15, 12, 10 Rest: 60 sec. Attach a close-grip V-handle to the pulley of a lat-pulldown machine, or use two single-grip handles as shown. Grasp the handle so your palms face each other and set your legs under the pad. Pull the handle to your collarbone, driving your elbows down and back. Sets: 3 Reps: 25, 20, 15 Rest: 60 sec. 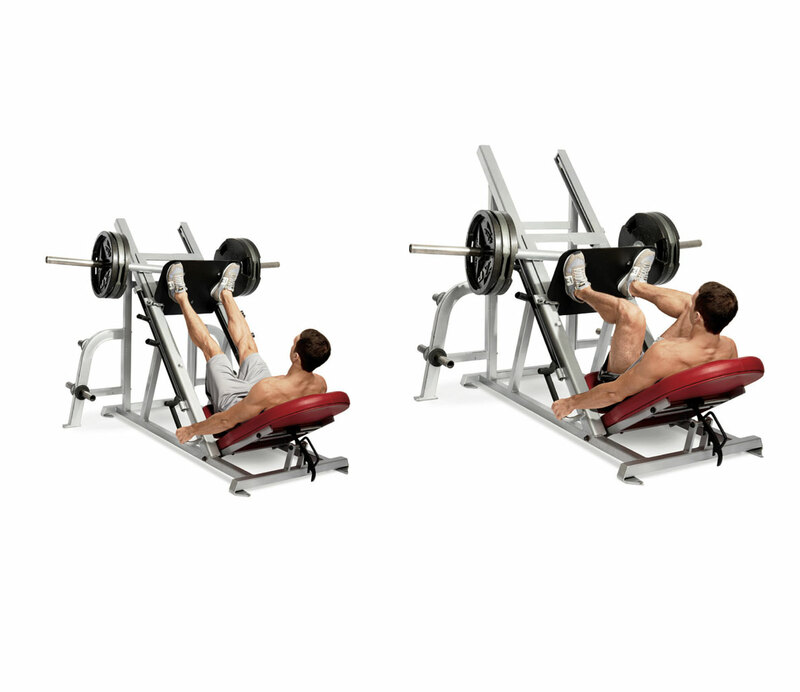 Set up in a leg press machine and place your feet at the bottom of the foot plate at shoulder width so that only the balls of your feet are on the plate. Remove the safeties and allow the weight to flex your ankles slowly until you feel a stretch in your calves. Extend your ankles to raise the weight back up. Sets: 4 Reps: 25, 20, 15, 10 Rest: 120 sec.